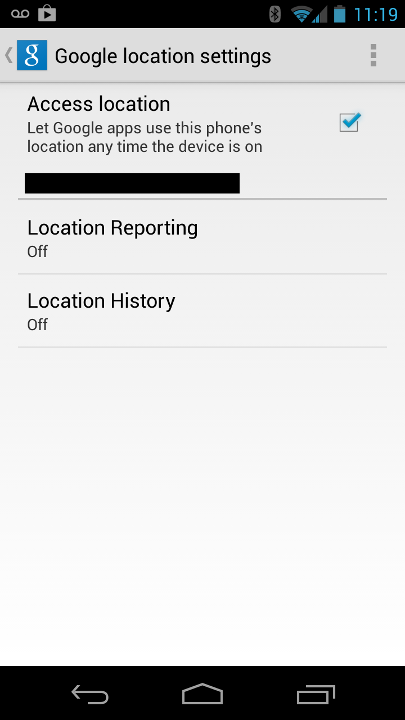 Several years ago, I wrote about how Google gets traffic information and how to turn off this location reporting on Android phones. Since then I’ve switched to iPhones. While I normally use the built-in Maps app, I keep Google Maps installed as a fallback—just in case. I upgraded my phone recently and so I spent some time going through all the apps and making sure they worked and didn’t have more access than necessary. This is when I discovered that the Google Maps app for iOS defaults to collecting location information and sharing it with Google. Given my previous post, this isn’t really surprising. Anyway, as with the Android post, here are the steps to limit Google’s collection of location information. 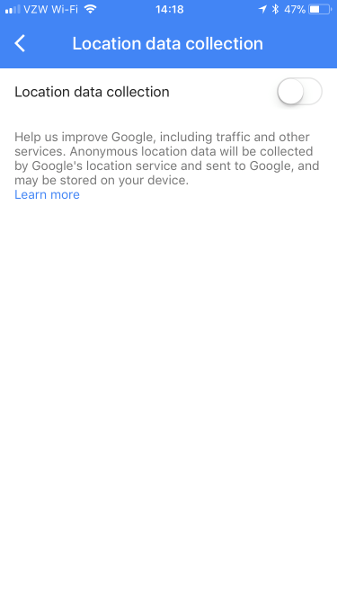 First of all, in Settings → Privacy → “Location Services”, I changed Google Maps’s permission to “While Using the App”. If I’m not using the app, then it doesn’t need to know where I am. 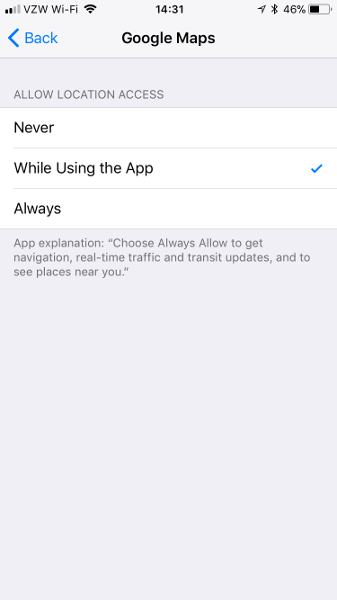 Second, in the app itself, go to: Settings → “About, terms & privacy” → “Location data collection”. That’s right, this setting is buried in what appears to be a page with the boring legal notices. That should do it…at least assuming that Google honors the settings in its own app. Radium-Schokolade (1925) — Radium-laced Chocolate. Sold as something to rejuvenate your organs by eating or drinking it. Untraceable communication — guaranteed — New untraceable text-messaging system comes with statistical guarantees. Michigan Terminal System Archive — It is good to see MTS live on as a historical curiosity and hobbyist OS. imap4 partial fetch request — Sadly, mutt still doesn’t have it. I really don’t enjoy waiting for a large attachment to get downloaded over a slow link just because I want to read the email body. Mathematicians invent new way to slice pizza into exotic shapes — I am not sure how some of those new shapes can possibly work in the real life without the notches essentially splitting the slice into a pile of mush that cannot be held. 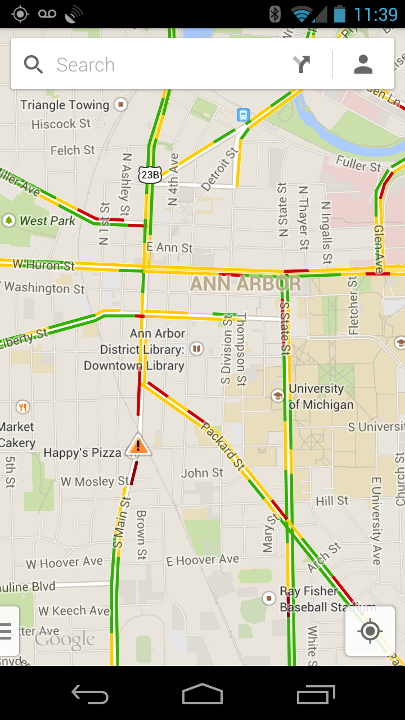 Ever wonder how Google gets its traffic information? Apparently, there are two sources. The first is the Department of Transportation. The second consists of Android users. You can always check Google Location History to see what sort of data Google has. (Of course, they may always have more than they show.) Seeing the data can be a bit unnerving. Since I’m not really into giving Google more data than they already have to begin with, and I see no reason for Google to know exactly where I spend my time, I decided to turn this feature off. 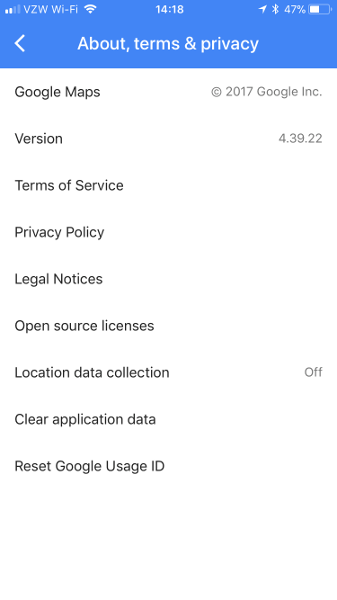 You can find the setting by running the “Google Settings” app. That’s right, not “Settings”. Once there, select “Location”. As you can see, I want to treat Google apps like any other vendor’s apps. As an added bonus, it looks like my GPS is on way less often.